EVITE EL ROBO. INSTALE UNA ALARMA COBRA. LOS SISTEMAS DE ALARMA COBRA SE INTEGRAN CON EL MANDO ORIGINAL DE SU VEHICULO. ¡ CONSULTENOS ! SISTEMAS DE AYUDA AL APARCAMIENTO. 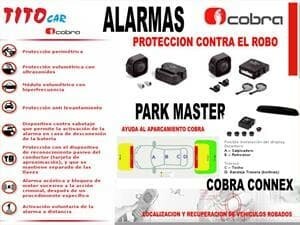 SERVICIO COBRA DE LOCALIZACION Y RECUPERACION DE VEHICULOS ROBADOS.